Glowforge Review: Thoughts and Impressions of Hands-on Laser Cutter! If you need a 3D laser printer at cheaper price, GloForge 3D Laser Printer might be a better choice. Unlike the typical 3D printers, the Glowforge printer cuts and engraves designs within a shorter time. The manufacturer has equipped it with an accurate laser – it can cut and engrave into almost any material from wood, cardboard, metal, plastic and charcoal. This is the standard model, costing $1995. With this model, you can make everything as advertised. The package is ideal for hobby, home and occasional shop use. Even though it is the least expensive, it will require adequate ventilation. Place the included 4-inch diameter hose out a window when using the Glowforge basic. The model has all the features available with the Glowforge basic. However, the manufacture includes an air filter, which allows usage in any place including those with deficient ventilation. To get the package, you need $2495. The Glowforge Pro W/ Air Filter is a professional package that the manufacturer constructs and designs for individuals planning to use the 3D printer frequently or in shared environments such as an office. The manufacturer has done several upgrades with improved tubes, optics and cooling. Due to the large pass-through, you can use longer materials, but you have to take more safety precautions. To benefit from the Glowforge 3D printer, you need a working area around 12×20 inches. That is comparable to the regular desktop printer working area. However, keep in mind that the ventilation requirements – unless you are going the ventilation way – will necessitate additional space. Due to the 0.5 inches focus range, you materials should not exceed 1.5 inches with the device’s tray removed and not larger than 0.5 inches with the device’s tray installed. Glowforge cuts and engraves into almost any material. However, the thickness it handles highly varies by the material. It can cut most ¼” acrylic and plywood on one side. You will need to flip the material if there is any need of cutting and engraving on the other side. Glowforge cuts and engraves leather, cork, paper, wood, plexiglass, rubber, foods, sandpaper, derlin, acetal and cardboard. The products that it can only engrave include rubber stamps, stone, corian, titanium, marble, ceramic tile, glass, anodized aluminium and some more. To make and perfect a design, consider using AutoCAD, Adobe Illustrator, Photoshop or Inkscape. And if you are not sure what to make or you are not a designer, start by checking Glowforge’s catalog for more project ideas and premium designs. The catalog help you search through the online design which features fully customizable and ready to print designs that ranges from wall arts, desk lamps, maps and more. The Trace Mode is another excellent feature on the GlowForge 3D Laser Printer. The feature allows you to cut and engrave hand-drawn illustrations onto the desired material directly. The Trace Mode scans the material with the drawing on it. It then cuts and engrave it accurately. Glowforge is also full compatible with various file formats for easier use. Whether you like working with PNG, JPG, SVG, TIF, AI, PDF, or DXF file formats, you will get exactly what you want. Also, you can drag and drop a design to position it with live preview. That allows easier and faster creation of personalized works of art. The GlowForge Printer features a wide-angle camera on its inside that provides the laser bed’s full view. That way, you can easily see the cutting and engraving process and eliminate the guesswork in-between. The printer recognizes various materials, learns their shape and executes the design accurately. Even more, the 3D Autofocus allows the machine to handle irregular shaped or curved objects to make the right masterpiece. The product also boasts a lens that keeps moving up and down and provides multipass focus, which you can shift between various depths for unique designs. The laser featured in the product uses custom CO2 laser tube, which functions at 10,600 nanometres. Glowforge Basic model uses requires 40 watts to function while the professional model requires 45 watts. The TEM00 tube provides a lot of power density with tiny spot size. That helps improve the engraving and cutting speed. In other words, you will not wait long to see your design printing. Moreover, the laser does not require any replacement, cleaning or realignment. That is because the manufacturer has completely sealed the optics. 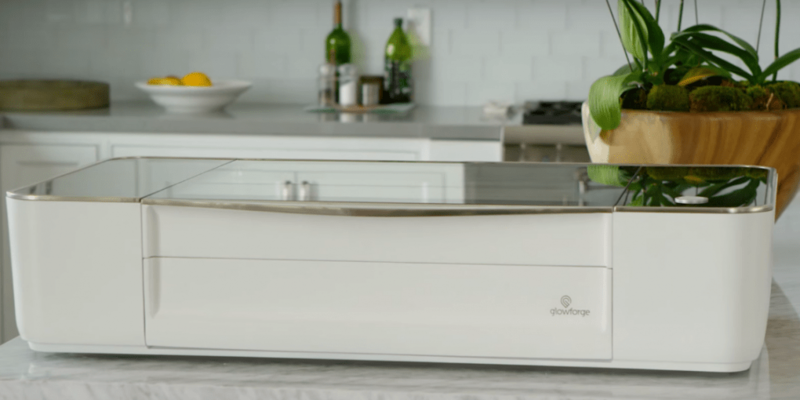 Glowforge will connect effortlessly to your office or home WiFi network in a few minutes. Therefore, there will be no need of running cables from your tablet or computer to the printer. You will keep everything tidy and nice. After purchasing the Glowforge Basic model, you will benefit from the 6 months warranty period. To benefit from a 12-month warranty, you will have to buy the Pro Model. If the machine becomes defective during the warranty period, the manufacturer will send a replacement. And if you experience problems or the machine becomes defective outside the warranty period, they will help you repair it. That might mean sending you the replacement parts – you will not incur any costs if the mistake is theirs. That holds true with the United States and the International customers alike. However, the international customers have to pay handling and shipping costs. Pre-ordering is now available through the manufacturer’s official website. As the manufacturing company, glowforge release date on at CES 2018 reported over $70,000,000 in sales for its 3D laser cutter, made in California by Flex. You can select one of the three packages ranging between $1995 and $3995 – that depends on your personal needs. Even though that might seem expensive for some individuals, before Glowforge entered the market, people required over $20,000 to benefit from the technology.